The game that’s all about using your head! Discover the quick question game of “What am I?” featuring all your favourite Disney characters. Ask questions to figure out if the cartoon on your head is a person or an object from one of your favourite Disney movies. Be the first player to guess what you are and win!Includes 6 Mickey Ears Headbands, 24 Mickey Chips, 1 Timer and 72 Cards. Contents may vary. For ages 7 years and over…. Play the classic game What am I, but with a Disney twist. Guess all your favourite Disney characters and wear the headbands with a pair of Mickey Mouse ears for non-stop fun and laughs. Discover the quick question game of What am I? featuring all your favourite Disney characters. Each headband has a pair of Mickey Mouse ears and ensures non-stop fun for kids. Board game information: 2-6 players. General information: For ages 7 years and over; As seen on TV; EAN/MPN/UPC/ISBN: 778988019689. WARNING(S): Not suitable for children under 3 years old. Only for domestic use; To be used under the direct supervision of an adult. This toy costs approximately £14.99 (for the latest and best prices make sure you check our retailer list for the Disney Hedbanz above). 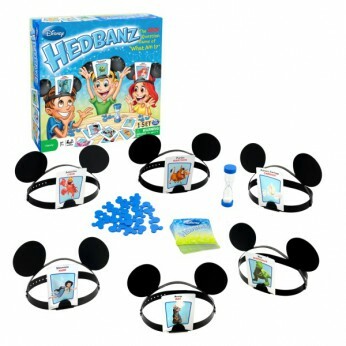 In our review of Disney Hedbanz we classed it as being suitable for ages 5 years, 6 years, 7 years, 8 years but recommend you check the manufacturer specific advice before purchasing.